Stand a chance to Win a R1500 Checkers/PnP Voucher with Consumer Rewards. 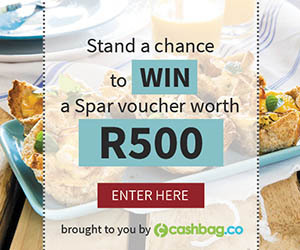 Get everything you need and make sure your cupboards are full when you enter to win this R1500 voucher that you can spend at either Checkers or Pick n Pay. I joined the competition and hope to win …i am a Pensioner and wish to buy some clothing for myself ay PNP and spend some on food at Checkers for Christmas when children come to visit. I enter this competition because my family always get food for december from another families and we eat Christmas on another families. So thise year I want that family always help us to come and eat christmas lunch at my family that reason I enter this competition and I want them to taste your fresh food. Times are tuff, so if i would won something i will spend it on food .I am a pensioner and it will help me so much in this time of year. Thanks for this chance of try to win. Thanks to Checkers/Pick@Pay.for this voucher. Greetings I have entered for this Competition in hope of winning so I can use this voucher to buy grocery for my mother for Christmas since she’s a domestic worker receiving Little money however since me and my sister had reach 18 years which means the grant which was helping is no more.As the facts that that she’s hard worker who works hard to support the family since my father died in 2007.I be so much grateful to win so I wipe her tears away . With my voucher I would like to provide to the underpriviledge to make somebody’s Christmas a very special and unforgetable occasion. I will to win this voucher so that i can buy my family groceries at Christmas. I would like to win this voucher because I want to make my family happy this Christmas. I need to assist someone in need with this reward. I would like to win ,so I want to build a house for my mother.